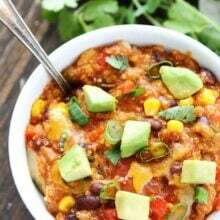 Slow Cooker Enchilada Quinoa-this easy and healthy slow cooker recipe is a family favorite. Add it to your dinner menu now! This post is in partnership with Old El Paso, but our opinions are our own. 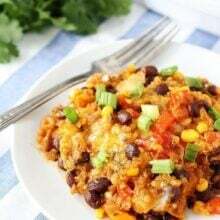 Our Black Bean and Quinoa Enchilada Bake is hands down one of the most popular recipes on our site. You guys love it and so do we. We make it for dinner all of the time! Several of you have emailed us and asked if we could create a similar slow cooker recipe. 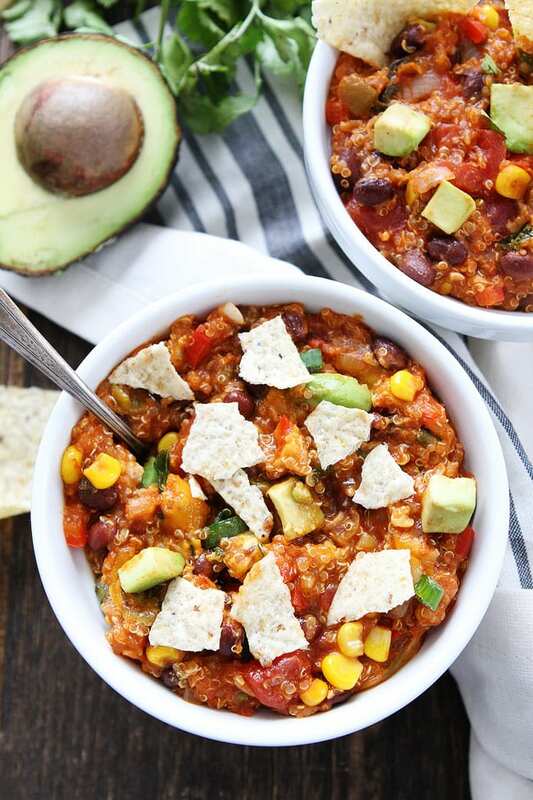 Well, today is your lucky day because we played around with the recipe and came up with a killer Slow Cooker Enchilada Quinoa. 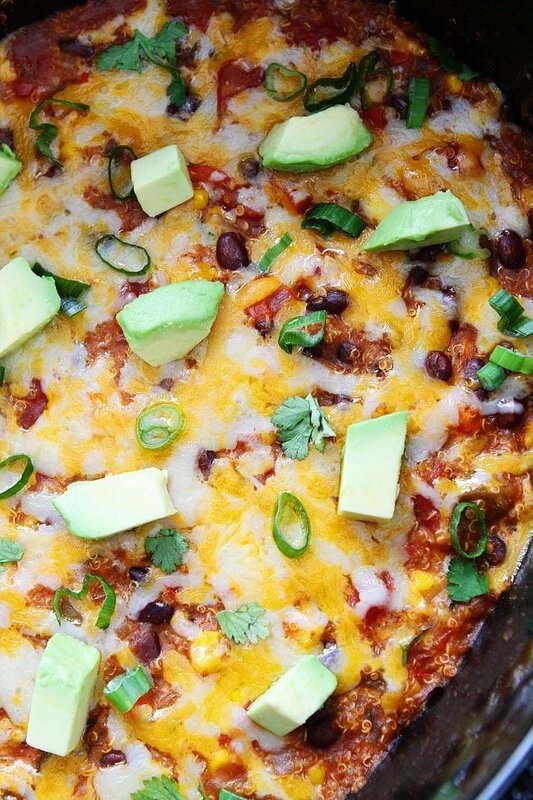 If you like our enchilada bake, you will LOVE the slow cooker version because it is SO easy! The slow cooker does most of the work and the results are mighty delicious! You only need about 15 minutes to prep this delicious dinner recipe. A little chopping, a little can opening, and you are good to go! Dump everything in your slow cooker and let it do the work! I was worried the slow cooker version wouldn’t be as good as our original enchilada bake, but IT IS!! It really is! The flavors are incredible! The quinoa tastes just like enchiladas, thanks to Old El Paso’s mild red enchilada sauce, and all of the other fantastic Mexican flavors going on! And do you see all of that cheese? Mmmmmm! When the cheese is melted, I top the enchilada quinoa with diced avocado, green onions, and fresh cilantro to finish things off. 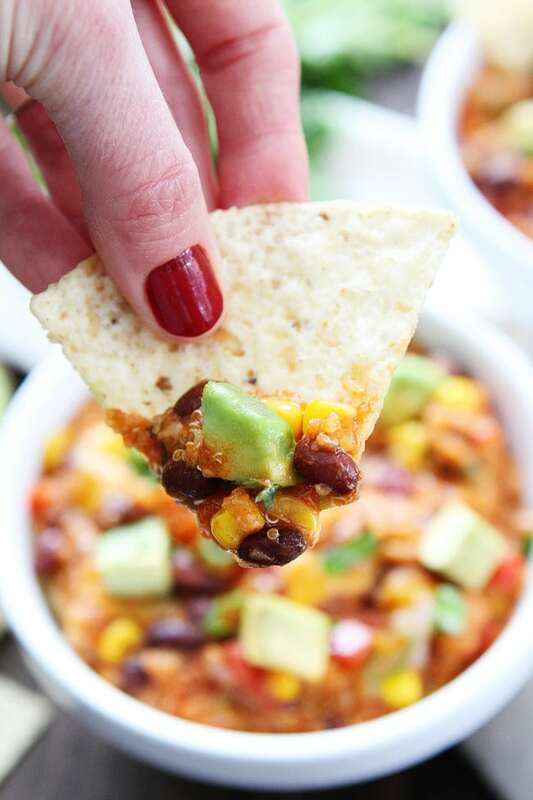 We like to eat the enchilada quinoa with tortilla chips! You can also serve tortillas on the side or eat it plain. It is good any and every way! 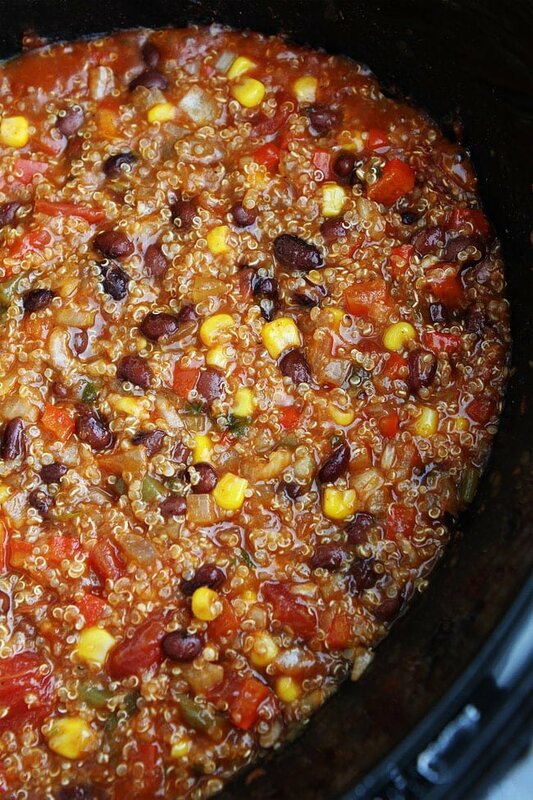 When we make this Slow Cooker Enchilada Quinoa for dinner our boys devour it! It is a family favorite and I am sure your family will enjoy it too! Add it to your dinner menu right this second! 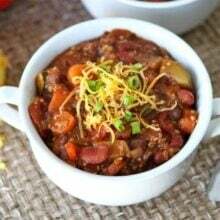 This easy slow cooker recipe is a family favorite! Serve tortilla chips or tortillas on the side! 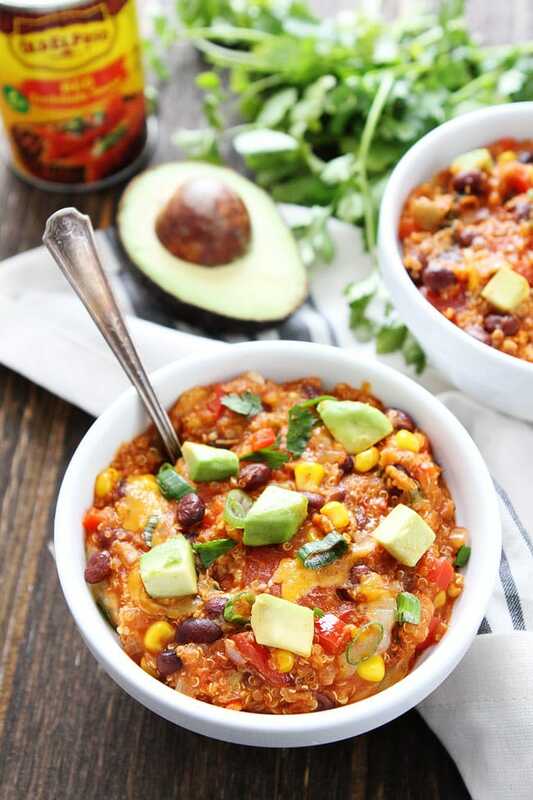 Combine the quinoa, water, onion, garlic, red pepper, black beans, enchilada sauce, diced tomatoes, green chiles, corn, lime juice, cumin, chile powder, and cilantro in a slow cooker. Stir to combine. Season with salt and pepper, to taste. Cover and cook on high for 3 hours or on low for 6 hours, or until the liquid is absorbed and quinoa is cooked. Remove the lid and stir the casserole. Taste and adjust seasoning if necessary. Stir in the half the cheese and sprinkle the other half on top. Put the lid back on and cook until the cheese melts, about 15 minutes. Ohhhh totally drooling! 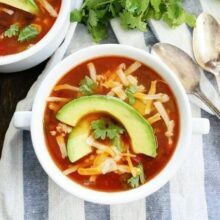 Can’t wait to add this to my menu this week! looks delicious for these cold weeknights we are having- yum! Yes, perfect for a cold night! I have been thinking about making something really similar to this! Love that this is made easily in the slow cooker! It says 3 hours on low or 6 hours on high. Is this a mixup? Can’t wait to try it! Oops! Thanks for catching my typo! I fixed it! this does sound really tasty! Hi, can i cook it normally? No slowcooker? This sounds so wonderful, Maria! 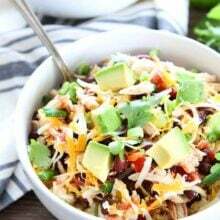 Love that you made it so easy by throwing it into the slow cooker! And those flavors…fuhgetaboutit 😉 Must try. This was so delicious!….and easy! Definitely adding it to our dinner rotation. Thanks for sharing! This was delicious! Where can I find the nutritional value of your recipes? This looks like a perfect meatless monday meal! Thanks! what’s the calories and nutrition in this reciepe? Hi! Do you think I could freeze this? Either before or after I baked it? Would you have the courtesy to mention what size slow cooker you used? We have a six quart slow cooker. Thanks. Just made this in my 4 Qt. Just fit. Added 1# fried ground beef, doubled the garlic, and used 2 paks low sodium Taco Seasoning instead of the loose seasonings you had. Took 5 hrs on high to get all the Quinoa “popped.” Nacho’s, Nacho’s, Nacho’s! This is terrific. Never eaten Quinoa. What’s it like? My husband refuses to eat things with “just” quinoa..he wants meat as well. Could ground beef be added to this? At what stage? I haven’t tried it, but I am sure it would be fine. Either add it at the beginning to cook or add cooked ground beef at the end. Can you add raw chicken breasts to this? Looks fabulous! this is great, see that it’s one of your top recipes of 2016 and can see why, I’d missed it the first time so glad to see it here, thank you for posting this! I made this tonight and it is phenomenal! We are so tired of eating out or eating frozen. This was simple enough a terrible cook like me can make it without bombing anything. I am making another batch for potluck tomorrow. Seriously…. everything you post looks delish!!! This recipe was so good! BUT! My family felt it made a better DIP for chips. Because it was a little on the spicy side and extremely thick, it was overwhelming for us to eat all by itself. Nice, healthy dip or topping. It makes so much though as a dip that I may have to give some away to the neighbor. Of vegetables (2 or sometimes even 3 large bell peppers) in the oven recipe, but don’t want to mess this up either because need to do this and (so grateful!) you made it into a slow cooker, may I use 3 bell peppers?? We love this recipe! We use it at least once a month for easy, yummy lunches. I’m just wondering if you have any calories or a nutrition breakdown available? Thanks! Delicious! We have made this half a dozen times so far and really enjoy it. An easy weeknight meal. WhT is the fiber. 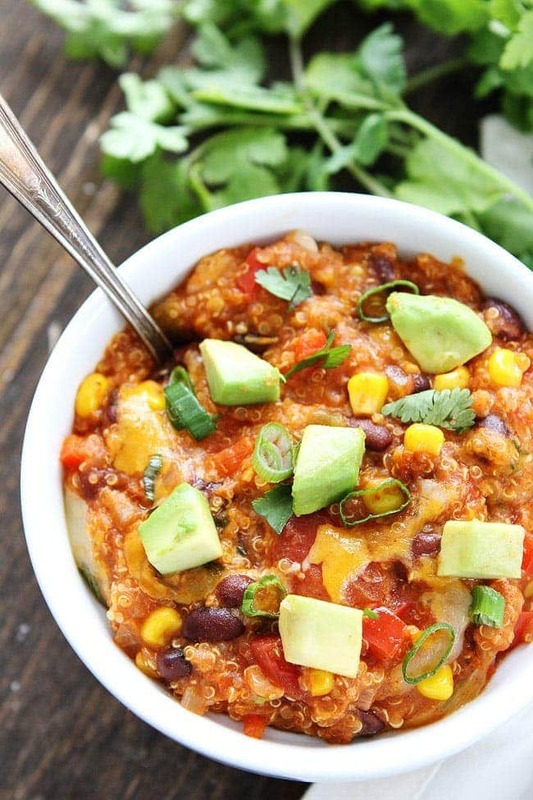 Intent of the slow cooker enchilada quinoa? This isn’t cool! This recipe was either taken from Betty Crocker or they took it from this website! Someone needs to be honest. This recipe was a collaboration with Old El Paso so they published it on their site too. Sorry for the confusion! We did create the recipe. Delicious and easy! It took very little time to prepare and the timing of cooking was accurate. Even without kids in the house, the dish was gobbled up! I am glad it was a hit! Delicious! Made this last night and was very happy with the meal. Directions were easy to follow and the result was fantastic. However, the recipe is for 8 people. Way more than we needed so make sure to cut the ingredients down if you are not feeding a large group. I made it for two people and still had yummy leftovers! Oh my goodness this was delicious. Your pictures were very enticing, and I knew I had to try it out. My husband loved it, but it was a little too spicy for my girls. Could one of the cans of enchilada sauce be omitted for another can of beans instead? Glad you liked it. You can cut back on the chili powder if you want it less spicy. This is absolutely amazing… and really easy to make! I was in awe about how something can take little effort and taste so good. I’m making this like every other week, now. I did replace the chili powder with cayenne pepper for a little more of a kick. I doubled the recipes into a 7-quart crock and it turned out great! Tip: I didn’t increase the cook time; I cooked for six hours on low then two on high and before it was time to serve and it was still too soupy for my expectation. I also didn’t drain the cans of vegetables, doing so will help with this too I presume. Love the original recipe, and curious how to adapt to an Instant Pot (vs slow cooker)? I just made this and it’s wonderful! I love the hesrtinesd of the quinoa with the enchilada flavors. Thank you.